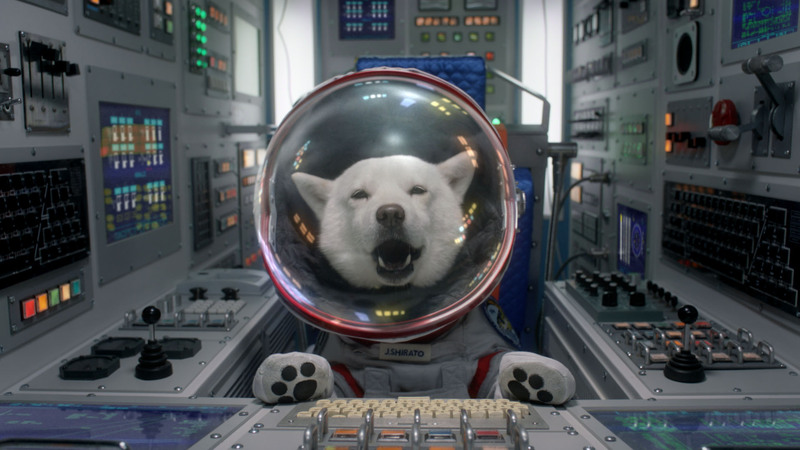 Space rover: "In space there is hope," says Otosan before blasting off in this two-minute ad made for last Christmas. Upper House election night, 2010. All over the country people are watching television and waiting to see if there will be an upset as the results from polling stations slowly trickle in. Photos of Shirato and his rival running for a seat in the House of Councilors flash on the screen. By this point, millions of TV viewers are likely to have cottoned on to what was happening — since it wasn’t just any dog that was staring out at them, looking resplendent in a straw hat but slightly uncomfortable about all the attention his “election victory” had sparked. 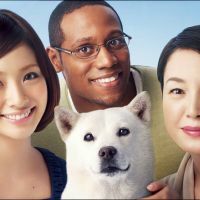 In fact, the new canine councilor was the dog usually known as Otosan (Father), the unlikely patriarch of an otherwise normal human family and the star of one of the most successful advertising campaigns Japan has ever seen. Yes, this faux “live” broadcast, which aired on multiple channels to coincide with coverage of the real election results that night, was in fact the latest in a long-running series of TV commercials for mobile-phone provider SoftBank. And indeed, Otosan’s dabble in politics was just the latest in a series of adventures he had embarked on with the inevitably half-hearted support of his wife Masako (played by Kanako Higuchi), daughter Aya (Aya Ueto) and black Western son Kojiro (Dante Carver). If so, that’s seriously impressive. Akiko Sekido, from Tokyo-based advertising analysis firm CM Research Center, said such figures are “top class.” In fact, she explained, they are all the more remarkable in view of the fact that corporate Japan has, in recent years, changed tactics to focus less on simply barraging people with ads and more on the cost-effectiveness of each campaign. But that’s not the only indicator of Otosan’s success. CM Research Center conducts monthly surveys of 3,000 randomly selected adults, asking them to identify TV commercials they liked that month. SoftBank’s “Otosan” ads have topped most of those polls for the last five years — so earning the center’s “Brand of the Year” accolade every year from 2007 through 2011. 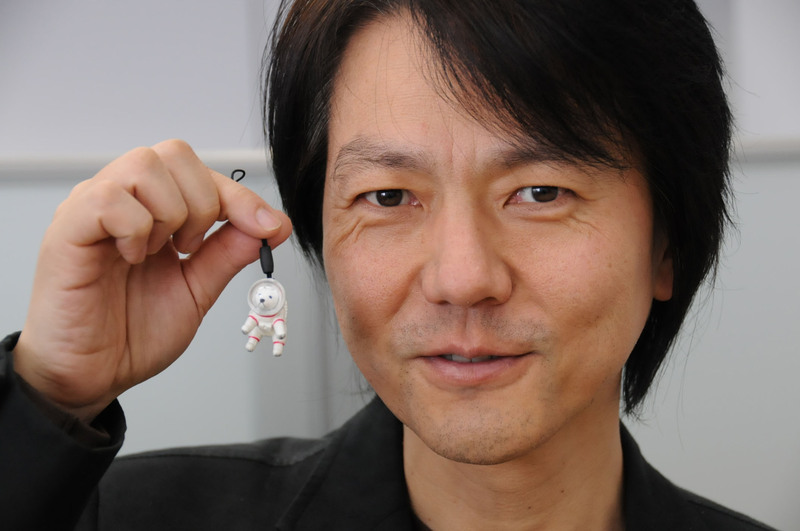 “No other series of ads has come close to achieving that level of popularity,” said Sekido. If there are any “newshounds” among our readers, it’s likely they are now wagging their tales in delight at the celebrity of one of their ilk. But perhaps they are also tilting their heads to one side in that endearingly confused doggy expression, thinking: Why a dog? And why just one dog, in a family that is otherwise all human? Otosan himself can be said to have three fathers: Creative director Hiroshi Sasaki; TV commercial planner Yoshimitsu Sawamoto; and SoftBank’s well-known president, Masayoshi Son — the value of whose input the two full-time ad men readily acknowledge. The story began in 2004, when Sasaki arrived at Son’s office with a pitch. At that point SoftBank was a successful information technology services company, Son was its ambitious president and Sasaki was a veteran creative director with dozens of hit commercials to his name, including the Suntory “Boss” canned-coffee ads (for which he would later use American actor Tommy Lee Jones). One year earlier Sasaki had resigned from advertising behemoth Dentsu to found his own company, Shingata. 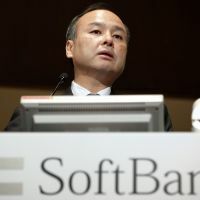 Sasaki’s objective was to convince Son to give him total control of SoftBank’s corporate identity, which the president had indicated earlier he wanted to revamp. And it worked. Soon enough, Sasaki had commissioned a graphic designer, Takuya Onuki, who came up with the now-familiar silver SoftBank “=” logo. He also started pulling a team together to start working on TV campaigns for the company’s first foray into the mobile-phone business, which followed its purchase of the ailing Japanese branch of U.K.-based Vodafone in 2006. That’s when things started going to the dogs, literally rather than metaphorically. As SoftBank’s Kurisaka recalled, Sasaki had a meeting with Son one day in early 2007 and asked him if he knew what the most popular animal in Japan was. That was important because he soon found that his boss, Son, was as demanding as he was ambitious. “This was a time when the competition between the mobile-phone carriers was fierce, so Son would often come up with new mobile-phone fee plans and new campaigns, and we just couldn’t keep up if we stuck to the normal pace of commercial production,” he said. Sasaki’s solution was to take a whole lot of footage of several dogs — nothing special, just dogs being doggy — and then add in pertinent and timely information by way of a voiceover. 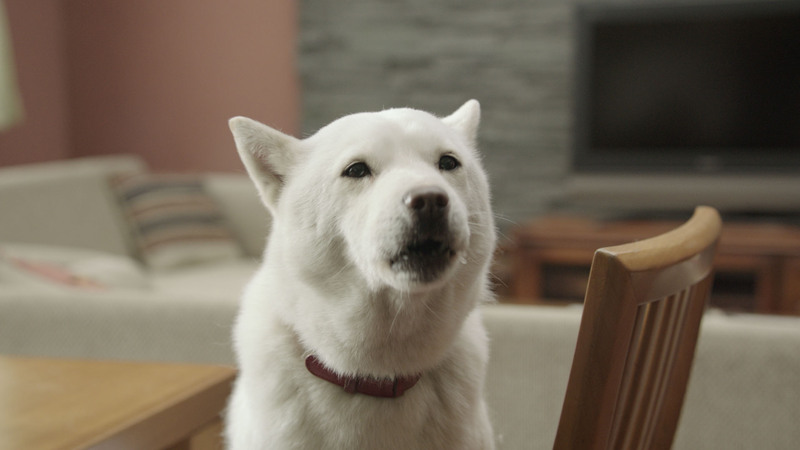 Commercials in which the dogs would be sitting around chatting about SoftBank’s latest plans could be made both quickly and cheaply. As Sasaki mentioned, things were moving fast. At around the same time, he was also producing a line of SoftBank commercials that were at the other end of the budget spectrum. In one series, Hollywood actors Brad Pitt and Cameron Diaz were shown walking down the street chatting on their SoftBank phones while rock ‘n’ roll played on the soundtrack. However, the speed at which everything was moving also spelled trouble. SoftBank’s servers were creaking under the increased traffic from new subscriptions, and the Japan Fair Trade Commission blew the whistle on the company for using the phrase “¥0” in its ad campaigns. That was, the commission determined, a misleading statement, since the ¥0 phone charges to which it referred came with many conditions that were written in almost illegibly small type. Sasaki determined it was time for the company to show a little humility in the wake of its glitz and glitch, and so when SoftBank came to him with a fee plan that would make calls between close members of the same family completely free 24 hours a day if they were using SoftBank phones, he suggested it simply be called the White Family Plan. “You know, instead of ‘Gold’ or ‘Platinum’ plan, you’d call it ‘White,’ ” he explained. “Actually I thought it would only be a short-lived thing.” However, the plan exists to this day — in part because it became the foundation on which Otosan and his ad series was built. One of the keys to Son’s business philosophy is that you should make the most of what you’ve got — and that was essentially the framework within which the Shirato Family was born. Meanwhile, as chance would have it at that time, SoftBank also had on contract the young actress and singer Aya Ueto, who was the face of another of the company’s enterprises, Yahoo! BB. She would have to be involved, too. And there was another piece of the puzzle: a black American named Dante Carver, who had been an extra in some of the few commercials that Sasaki made for Son while the Vodafone brand was still in use. In the ad, the executives discover to their surprise that the phone’s screen can swivel 90 degrees, to which Carver says, somewhat out of the blue and in broken Japanese, “Kiite imasendeshita” (“No one told me anything”). That phrase is known to every Japanese person as being the stock excuse used in business, the bureaucracy and beyond to evade accepting responsibility — and coming from Carver’s mouth it struck such an amused chord nationwide that his character was soon repeating it on other Vodafone ads, too. Hence the composition of the family gradually fell into place. 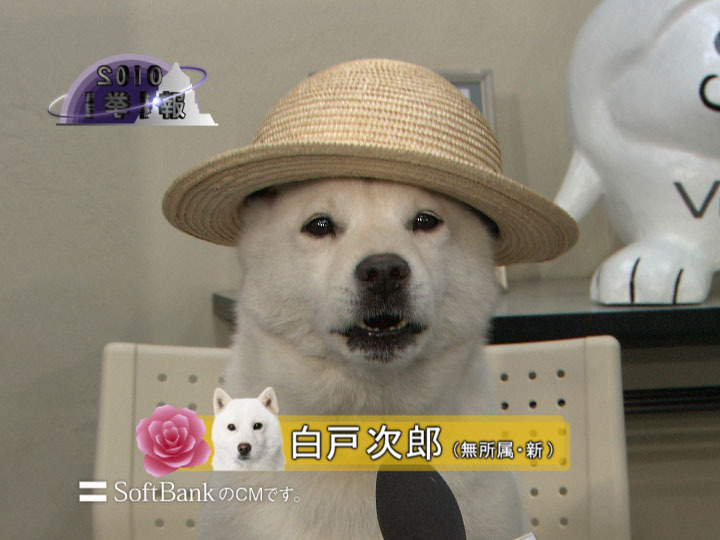 There would be Ueto, the daughter, who would work in a SoftBank shop, her brother, played by Carver — and then there would be a dog, somehow and somewhere in the mix. Enter Yoshimitsu Sawamoto, a 45-year-old employee of Dentsu whose work as a CM (commercial) planner involves actually thinking up the content of TV ads and writing the scripts. 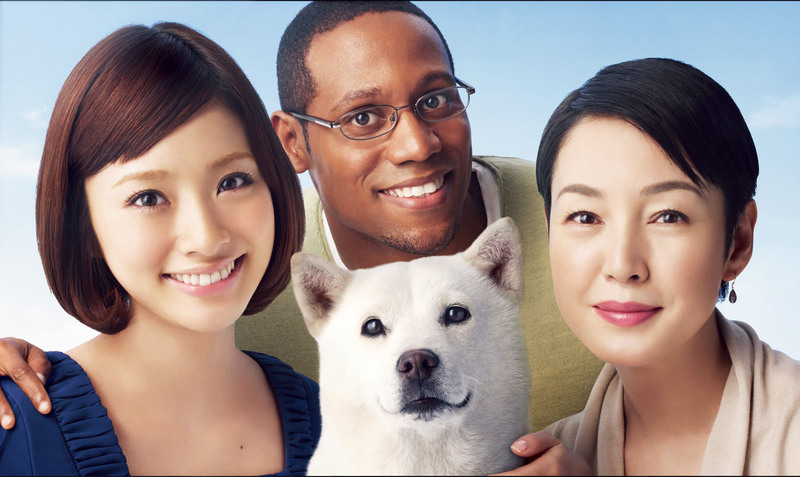 It was Sawamoto who had created the initial voiceover dog ads for Sasaki, and he now came up with the idea that the father in the White Family Plan ad family could actually be the dog. Son approved — though he made sure one of his favorite actresses, Higuchi, would play the role of the mother. Sawamoto, whose other recent successes have included the Toyota “ReBorn” series featuring French actor Jean Reno as the iconic cartoon character Doraemon, explained that one of the keys to the Otosan commercials’ success has been the fact that there is only one major twist. “If you just read the scripts, then there is actually nothing very odd about the ads themselves. It’s just that the role of the father is played by a dog,” he said. To further the “normalness” of the ad series, the dog’s voice is provided by one of Japan’s most well-known actors of authority figures — the “Laurence Olivier of Japan,” as Kurisaka described him — 69-year-old Kinya Kitaouji. “That was important as we wanted the father to be in the old-school mold: dignified and proud, but also kind of endearing in his fuddy-duddyness,” Sasaki continued. Just the right balance of dignity, pride and cute fuddy-duddyness, Sasaki explained, also existed in the dog who was selected for the role — a snow-white (naturally, for the White Family Plan) Ainu-ken (breed) born three years earlier in Hokkaido and named Kai. Kai has also matured into his role as a celebrity, it seems, and he now lives in Chiba Prefecture and is represented by the animal talent agency, Shonan-Animal Production. Kurisaka explained that SoftBank signs yearly contracts with the agency — a rarity in dealings with animal talent, he said, in which per-job payments are the norm. Neither Sasaki nor Sawamoto said they expected the “Shirato Family” series to continue this long, but the very first ad, which aired on June 1, 2007, set the tone for all those that have followed. In that TV commercial, SoftBank staffer Ueto is minding the counter in a SoftBank shop. “What is the White Family Plan?” she is asked by a customer, to whom she explains it means free domestic phone calls for family members 24 hours a day. “I don’t want to talk about work at home,” she answers. “I want to know, too,” chimes in her brother (Carver). “I thought you were going to be late tonight?” she responds. “No one told me anything,” he says, echoing the Vodafone ad dialogue that made him famous. “I want to know too,” says the dog, making his first appearance. “What do you need to know for,” asks the mother, hinting — but not saying — that a dog would have no use for a phone. “I’m sorry, Father,” Carver says, sitting up straight. The ad was a hit and quickly spawned others as new payment plans were devised and added to SoftBank’s roster. It’s now known, for example, that Otosan is a school teacher, that he was once an exchange student at the Sorbonne in France and that he has a cousin who lives in Honshu’s remote western Shimane Prefecture. On the technical side of the commercials’ creation, meanwhile, the producers from the outset established several rules for themselves — one being that as few digital effects would be used as possible. 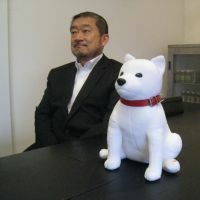 “It would have been easy to make the dog’s mouth move in time with the dialogue, but viewers would have been able to tell immediately,” explained Sawamoto. If anything, they have tried to do the opposite. They shoot as many variations of Kai’s barks and growls and yawns as they can, and then often try to think of dialogue that looks like it fits his natural mouth movements. 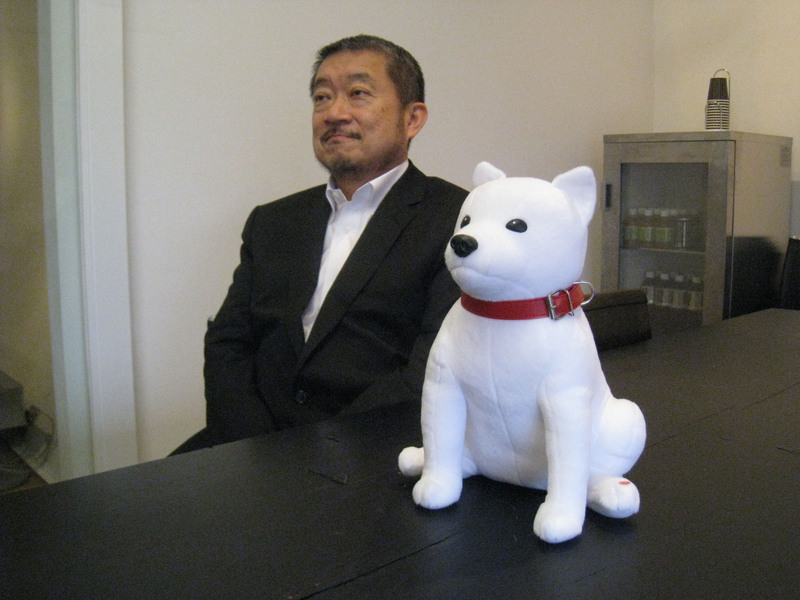 “So it actually looked like the dog was saying lines like ‘You’re still too young to know,’ ” Sawamoto explained. TV commercial researcher Sekido suggests that the reason for the mass appeal of the Shirato Family ads is that they form a continuous narrative. “The ads are fun, and by now viewers know that more and more will be coming, so they naturally look forward to seeing them,” she said. However, Sasaki and Sawamoto identified another reason for that success: Masayoshi Son. “Son actually attends the first meetings when we make presentations about upcoming ads, and that’s unusual,” Sasaki said. 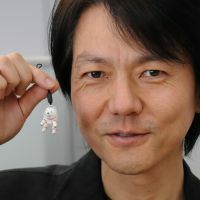 Although Son often offers concrete advice on the content of ads, Sasaki said he also often complains that proposed punchlines are not funny enough. “The usual comment from a client is that the product needs to be more prominent. I’d never been told by a client to work on the punchline!” Sasaki said. Sawamoto now cites the election day ad as one of his personal favorites. Just this past week, SoftBank has been airing the first Shirato Family ads to be shot overseas — in Rome, to be precise. Like all the ads, of course, the decision to go overseas was not random, but flowed naturally from a payment plan it aims to promote — one that offers fixed-rate charges for Internet use on SoftBank mobile-phones overseas. 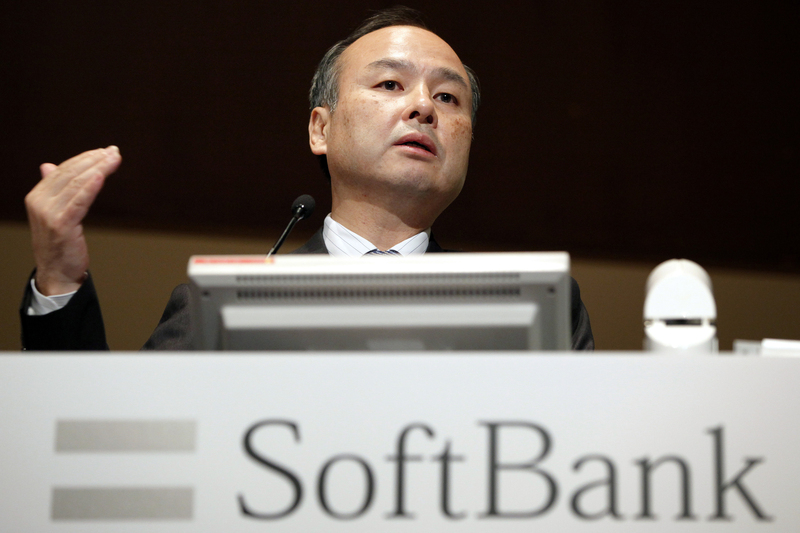 With the foray overseas and a dog-actor change in the air, it is clear that SoftBank and its creative partners are eyeing a long-term future for Otosan and his family. Sasaki said he hopes “it turns out like the ‘Sazae-san’ of the advertising world,” referring to the title of an animated TV drama that has screened on Sunday nights for the last 43 years. Given the continued performance of the series in CM Research Center’s surveys, it seems the public is hoping the same.